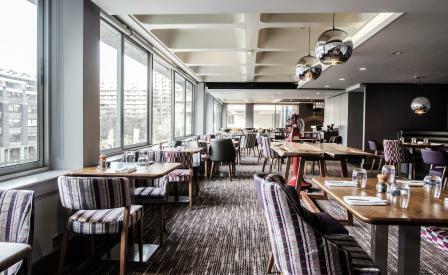 As the largest performing arts centre in Europe and home to the Royal Shakespeare Company as well as the London and BBC Symphony Orchestras, understandably food has never been the focus at London’s Barbican Centre. This is all set to change though, with the arrival of chef Anthony Demetre’s new restaurant, Osteria. Located on the second floor of the Grade II listed Brutalist building, the restaurant’s windows are smartly lined with tables, providing diners with views of the centre’s iconic fountains. Led by head chef Patrick Leano, formerly of Demetre’s Michelin-starred Arbutus in Soho, the bold menu focuses on seasonal Italian produce; creamy burrata is served with crispy artichokes and sweet carrots and hazelnuts, while the suckling pig yields to the gentlest pressure of the fork. We suggest kicking off with a rum-infused Negoroni before settling into a starter of grilled octopus with potatoes and smoked peppers, followed by a deliciously al dente veal tagliatelle. Finish off with a blood orange semi-freddo before retiring to the bar for a postprandial tipple.